In much the same way that José González is from Sweden and not Spain, Paolo Nutini is not a smooth Italian pop star, but a soul-influenced adult alternative singer and songwriter from the exceedingly not continental town of Paisley, Scotland. Raised in a music-loving family, with influences ranging from folk to opera to the jazz and R&B favorites of his father, and discovering homegrown folkies like John Martyn in his teens, Nutini left school in his mid-teens to focus on developing his own musical chops. Moving from Paisley to London at age 16, he garnered enough attention in local showcase clubs to be signed to the British arm of Atlantic Records just after he turned 18. 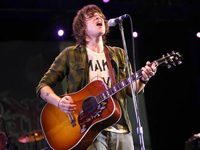 Working with Coldplay and Badly Drawn Boy producer Ken Nelson, Nutini was the recipient of an impressive amount of label buzz even before his first single, “Last Request,” was released in the early summer of 2006.